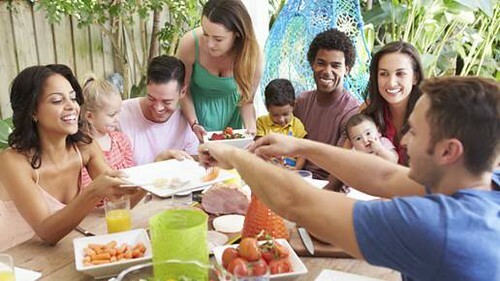 A group of people eating healthy food. Today, we are delighted to announce the release of the 2015-2020 Dietary Guidelines for Americans. We know that a lifetime of healthy eating helps to prevent chronic diseases like obesity, heart disease, high blood pressure, and Type 2 diabetes. The Dietary Guidelines provides a clear path for the general public, as well as policy makers and health professionals and others who reach the public, to help Americans make healthy choices, informed by a thoughtful, critical, and transparent review of the scientific evidence on nutrition. Obesity and other chronic diseases come not only with increased health risks, but also at a high cost. Healthy eating is one of the most powerful tools we have to reduce the onset of disease. The latest edition of the Dietary Guidelines focuses on three main takeaways to help Americans make decisions about healthy eating. The path to improving health through nutrition is to follow a healthy eating pattern that is right for you. The science behind healthy eating patterns tells us that they can help prevent chronic diseases like obesity, heart disease and Type 2 diabetes. A healthy eating pattern can be maintained over a person’s lifetime and, at appropriate calorie levels, promotes health and supports a healthy body weight. You can include many of the foods that you enjoy in a healthy eating pattern. limits saturated fats, trans fats, added sugars, and sodium. There is more than one type of healthy eating pattern — the 2015-2020 Dietary Guidelines includes various examples of healthy eating patterns. Learn more about healthy eating patterns and read the top 10 things you need to know about the Dietary Guidelines to learn more. It’s easy to get overwhelmed by the idea of changing what we eat. By focusing on small improvements, eating healthy becomes more manageable. With so many choices to make every single day about what to eat and drink, each choice is an opportunity to make a small, healthy change — like replacing refined- flour bread with whole-grain bread. Here’s more food for thought — almost 9 in 10 Americans get less than the recommended amount of vegetables. Instead of a whole new way of eating, find new ways to incorporate more veggies to dishes you’re already making. Further, Americans adults consume about 50 percent more sodium than the Dietary Guidelines recommends. Use the Nutrition Facts label to check for sodium, especially in processed foods like pizza, pasta dishes, sauces and soups. See more examples for making small shifts to food choices to help ensure that meals are nutritious, healthy, and delicious. Many Americans may need to make changes to their food choices and get more physical activity to stay healthy, but they shouldn’t have to do it alone. Everyone has a role to play in encouraging easy, accessible, and affordable ways to support healthy choices at home, school, work, and in the community. 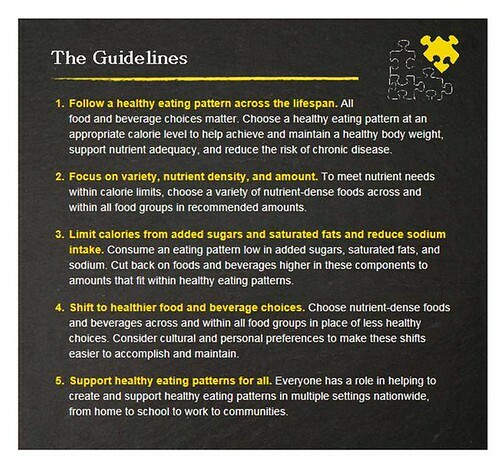 The 2015-2020 Dietary Guidelines for Americans includes examples of strategies that support healthy choices. Learn more about how you can help support healthy choices. HHS and USDA share a responsibility to the American public to ensure that advancements in scientific understanding about the role of nutrition in health are incorporated into the Dietary Guidelines on a regular basis. To reflect the most recent science, HHS and USDA release a new edition of the Dietary Guidelines every five years. We’re grateful to our federal partners who worked with us to develop the Dietary Guidelines. For additional information, be sure to check out ChooseMyPlate.gov from USDA and new resources on Health.gov from HHS that will help health professionals support their clients and patients in making healthy choices. Please visit the website and explore the latest edition of the Dietary Guidelines and learn more about better health through nutrition. For more information for consumers, visit ChooseMyPlate.gov.